The hypothyroidism test panel is ordered by people interested in checking blood markers that might indicate an underactive thyroid gland. What does the hypothyroidism test panel test for? The hypothyroidism blood test panel measures your free & total T4, thyroid peroxidase (TPO) antibodies, and TSH blood levels. Why is the hypothyroidism test panel important? The hypothyroidism test can help identify hypothyroidism that can be treatable. This Hypothyroidism Test Panel is a blood test. This hypothyroidism test panel, also known as a hypothyroidism lab test, low thyroid test panel, and an underactive thyroid blood panel, checks lab test markers that looks for an underactive thyroid gland (hypothyroid). The main problem that defines hypothyroidism is that the thyroid gland cannot produce the amount of thyroid hormone that the body needs to run effectively. In the US, it is thought that up to 5% of the population have at least a very mild form of hypothyroidism. Thyroid hormones are needed for a number of processes that keep the body's metabolism going. Low thyroid hormone production - primarily thyroxine (T4) which gets converted into triiodothyronine (T3) - during hypothyroidism leads to a slowing down of major functions in the body. Symptoms of this happening might include being tired or depressed, feeling cold, dry skin, brittle hair or memory loss. Constipation is another common symptom. Poorly controlled hypothyroidism during pregnancy - an added challenge because a pregnant mother requires more thyroid hormone - can lead to miscarriages or intellectual and growth delays in the baby. There are a number of possible reasons why someone might be producing inadequate thyroid hormone. Worldwide, the most common reason is iodine deficiency which often manifests in a neck swelling called a goiter. Fortunately, the widespread introduction of iodized salt has help correct hypothyroidism from low iodine levels (measurable through a blood iodine test) in many places. Conditions in which the immune system is malfunctioning can lead to it inadvertently attack the thyroid and cause damage of the thyroid tissue. In these instances, antibodies specifically directed against the thyroid can be identified with blood testing as is the case with Hashimoto's thyroiditis testing. People who have had procedures on their thyroid such as surgery to remove a thyroid nodule or irradiation of the thyroid to treat cancer also may have hypothyroidism. Prescription medications such as amiodarone, lithium and other less common cytokine medications can also cause low thyroid function. Because most of the lab markers tested in a hypothyroidism panel rely on standard equipment that almost every lab location has, getting a hypothyroidism test near you should not be difficult. 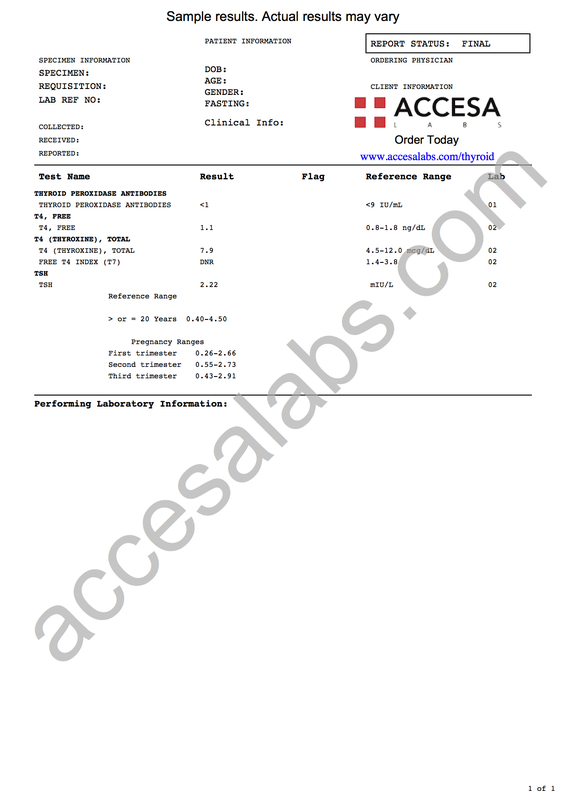 The relevant lab tests do require a blood draw and no fasting is typically required. While this hypothyroidism panel offers a more in-depth analysis of the possibility of an underactive thyroid, some people might consider starting with a TSH test which offers a simple screening test that can sometimes identify the possibility of a hypothyroid state. Hypothyroidism is typically treated by replacing the thyroid hormone with prescription medications such as levothyroxine or supplements. By replacing the thyroid hormone that isn't being properly produced, one can reduce the symptoms typically associated with low thyroid function and experience a better quality of life. For people taking thyroid supplements or medications, ongoing TSH, free T4 testing, and total T4 testing are usually performed to make sure that the thyroid hormone levels are in the proper ranges. Pregnant women require closer TSH and T4 monitoring given the increased thyroid hormone needs during pregnancy and the higher variability in blood levels. Untreated, severe cases of hypothyroidism can lead to a condition called myxedema coma which can lead to a life-threatening drop in body temperature and heart rate. While hypothyroidism is typically a lifelong condition, the availability of easier access to medications and lab testing to optimizing medication dosing has made living with an underactive thyroid more tolerable in this day and age. For more comprehensive thyroid screening, consider the comprehensive thyroid panel. Hypothyroidism Test Panel at Guaranteed Prices.